Optical interconnects have long served as data bridges between elements of large systems or clusters, and they’ve taken many forms. Since 2000, embedded optical modules (EOMs) have supported supercomputers, core routers, and an array of other interesting and unique applications. Active optical cables (AOCs) arrived in 2007 as a practical, low-cost alternative to regular pluggable modules, and quickly found a home in high-performance computing (HPC) clusters. The market for AOCs has now moved beyond HPC clusters and Ethernet applications now dominate unit shipments whether connecting servers to switches or between switches. Mega datacenter builders have discovered the economics of deploying AOCs within equipment rows. 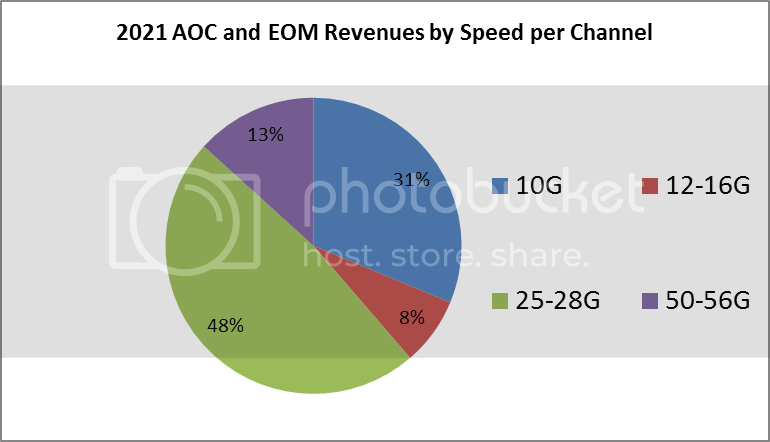 While 40G AOCs have peaked, 100GbE AOCs have picked up the slack and have already edged ahead in revenue. LightCounting thinks the future for AOCs is bright with even stronger growth than our year-ago forecast, reaching $710 million by 2021. Much of this is due to acceleration of data rates from 40G to 100G and 200G within our forecast period. As server speeds increase from 25G to 50G, AOCs become an attractive alternative to Direct Attach Copper in some large installations. Even consumer applications bode well for AOCs with new USB-C ports on most computers. The reach of 40G Thunderbolt 3 over copper is just two feet. This will give AOC versions the edge for some users, even with associated higher pricing. In contrast, the EOM market has really been a collection of niches which has made it lumpy and large-order sensitive. For example, combined market revenues peaked in 2012 with a strong HPC market. 2013-2014 brought a slump followed by a nice recovery in 2015. That recovery was short-lived, however, as some programs rose and others fell. With such a lumpy and variable past, what does the future hold? LightCounting thinks the long-term future for EOMs is bright, but the next two years will be soft. As one supercomputer program appears to be ending, another is just getting started. One optical backplane deployment has consumed quite a lot of EOMs, though other new programs in that category will take more time to develop. When they do, they will serve applications that would stretch the reach of copper and bode well for deeper penetration into large systems. We’ve seen early disaggregated rack programs that were more about sheet metal, packaging and power supplies. Now disaggregation means separating pools of system resources and interconnecting them with optics. This will be another way to bring advanced optical interconnects into the data center. Finally, military, aerospace and industrial programs for EOMs are quite numerous. While each is modest in unit quantities, their tougher specs offer growing revenue opportunities with weighted-average A.S.P.s actually increasing over the forecast period. We predict that the combined EOM market will grow from $84 million in 2016 to $208 million by 2021. The forecasted breakdown of revenue by speed per channel is shown in Figure 1. For makers of AOCs and EOMs, these markets are a complex mix of product configurations and applications. LightCounting’s combined AOC-EOM Report and Forecast sorts it all out and explains what’s happening and why. Seventeen categories of products are individually tracked, forecasted and mapped into five application segments: HPC, core routing, data center, optical backplanes and mil/aero/other applications.